I figured since this was my third review, I would do three games at once. They’ll be short though so that I don’t take up too much of your time. All 3 are what could be considered impossible games.There’s really not too much to say about these type of games other that they never end and they’re impossible and they’re impossible because they never end. For the most part, they follow basic platforming principles. You go right and jump over or onto things that are in your way. The main difference between these and a traditional platformer is that you don’t stop moving. The game progressively gets trickier and timing becomes more and more precise. There is no respite like a normal platforming game. You just go until you lose. Released in ’09, I think it might have been the first game of its type on XBLA. It might have been the first of its kind in general, but I’m not sure. I can’t find evidence of one and my memory fails me aside from maybe Adult Swim’s Go Right, but that one was hardly impossible. Even if it wasn’t the first though, The Impossible Game is one of the the most notable, jumping from XBLA to iTunes and Android, making it the namesake of the genre. This is the most basic impossible game. The “characters” consist of triangles and squares. You are a square and you can use other squares as platforms to jump onto, but if you hit them sideways, you die. You don’t get along with triangles at all. Any contact with a triangle and you die. 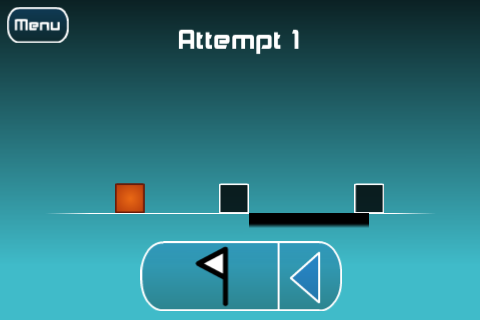 You jump over triangles, or jump onto squares to give you extra height to clear a gap or jump over more triangles. That’s pretty much it. I know that sounds really simple but you need to be super precise with this one. There is very little margin for error. Your timing and reaction skills get severely taxed even just 30 seconds into the game. I have reason to believe that, despite what I said earlier, this game does have an end. It is perhaps also the most rewarding since, even though you might never reach the end, you at least get the feeling of making some progress. There’s a pattern to the shapes that come at you, so through patience and memorization you at least accomplish a section which you will then have to repeat when you die moments later. The fact that they have released a level pack for it further lends credence to this theory. But I’ll never know for sure. I certainly don’t have the patience to find out. For a mere 240 Microsoft points you can be harassed by obnoxious techno music! I refuse to spend much time on this game. I feel I was swindled by my love of kittens. Just look at that cute, fat, smushy, little thing. Yup, that’s what drew me into this one. Kittens, I love ’em. I would be that crazy old cat lady if I were old… or a lady. Anyway, this game isn’t a writhing mass of cuteness like I thought it would be. Instead it was a hated impossible game wrapped up in a flashing, seizure-y, techno-infused, package. 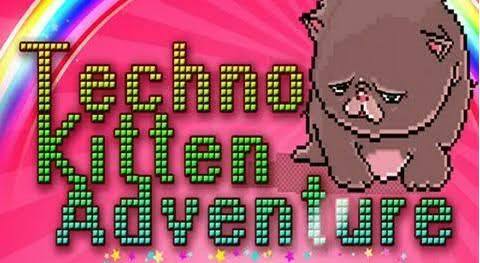 Yes I’m aware that “techno” is in the title, but the kitten blinded me of its existence. Positive points for this game: It has the widest variety of options, stages, kittens, etc, that I’ve ever seen in an impossible game, which would give it significantly more replay value. Also, all the menus make kitten noises. Negative points for this game: Everything else. Instead of playing this game, you could easily just go to a rave and pretend your a kitten and randomly rub against strangers. But you shouldn’t, because raves are for idiots. The most memorable part of video games, for me, is the music. There’s a reason why 20 years later we still hum the Sonic the Hedgehog theme. So if a bad game has good music, it might still be worth playing. Zombie Accountant isn’t necessarily a bad game but I really can’t stand these impossible games and my thoughts of, “Ugh! Another zombie game? !” almost had me passing this one over completely. I’m glad I didn’t. If for nothing else, it was worth it for the music alone. It’s got a pretty rockin’ chiptune soundtrack that comes from “The Factory” by Multifaros, whose website can be found here. Zombie Accountant was developed by Going Loud Studios, and it follows your basic impossible game formula. Things are in your way, you have go jump over them, all while it continually gets faster. 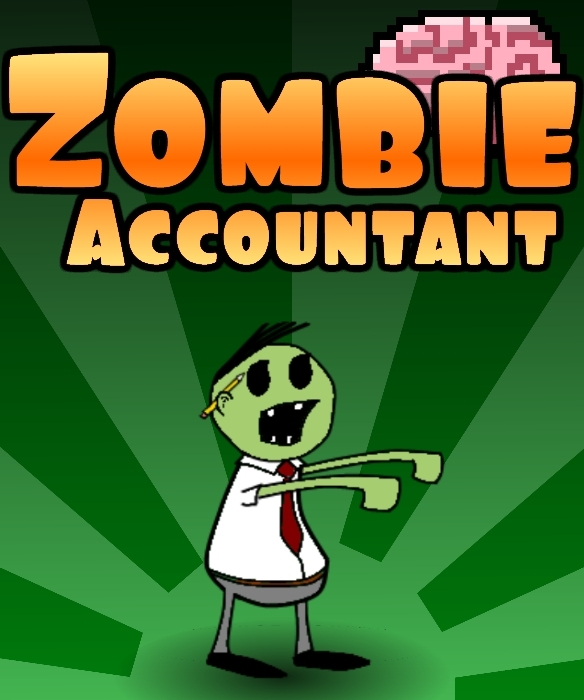 However, they’ve injected a fair blend of humor to give this game its own flair, the fact that you are an accountant that is also a zombie for starters. There are a few other details that make this one stand out in the impossible game crowd. For example, there are actually TWO commands rather than the ubiquitous jump button; you can also duck! You must duck under the other accountants. DON’T JUMP! You have no idea how many times I keep trying to jump over them. It’s just a reaction. It seems like you would be able to, but don’t bother, you can’t. The sooner you learn that the better. Your job is to collect files which are haphazardly floating around for some reason. The more you collect and the less filing cabinets you bump into, the faster you go and the higher your score multiplier gets. I don’t seem to be able to get more than a x3 multiplier, so good luck. Score enough and you can get a promotion, which negates one of the brains you’ve accidentally removed from an accountants cranium. After your 3rd infraction, you are awarded with your Termination of Employment scorecard. Apparently eating too many brains can get you fired. Whether you were hired by this accounting firm as a zombie, or being an accountant turned you into a zombie (which could be an intended pun), is never revealed. Please feel free to leave any comments/suggestions/ideas/yell at me. Like me on facebook if you enjoyed any of these posts. Posted on July 2, 2011, in Indie Games and tagged 360, android, chiptune, impossible game, indie, iphone, itunes, multifaros, platformer, techno, techno kitten adventure, xbox live, zombie, zombie accountant. Bookmark the permalink. Leave a comment.